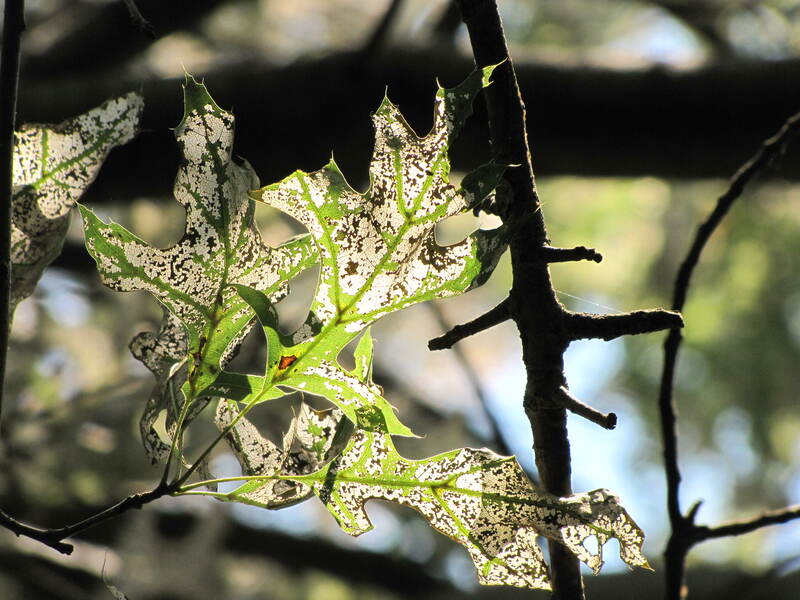 These pin oaks are shedding leaves, and large parts of some of them have leaves that look white from the ground. 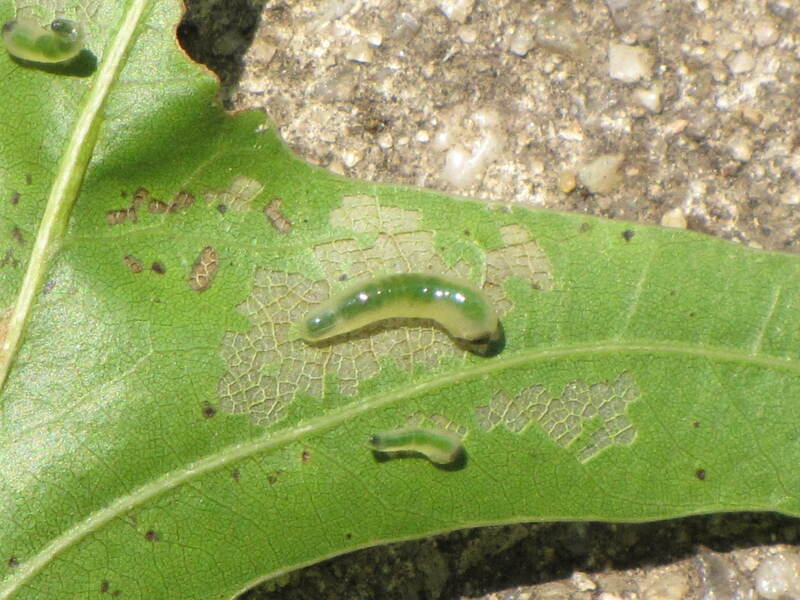 The culprit is scarlet oak sawfly larvae. I have never seen damage quite like this from this insect. 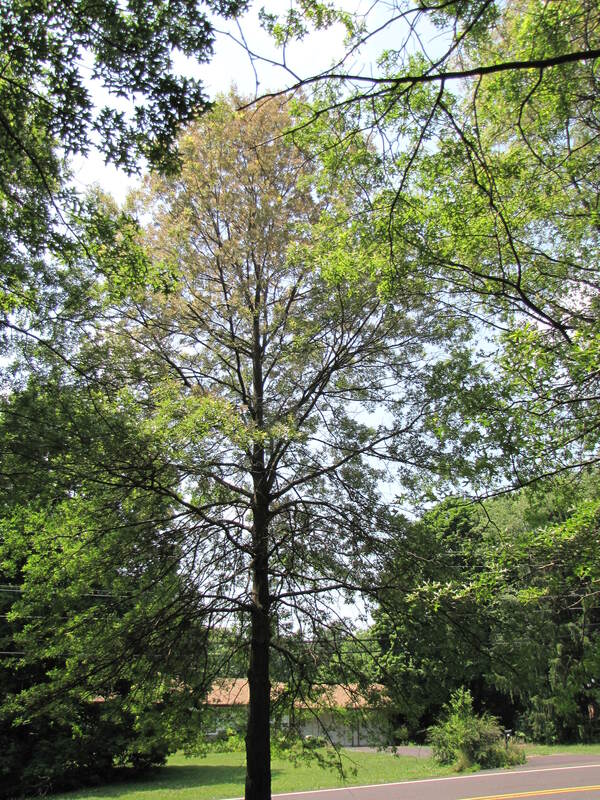 It’s unusual for it to reach such a high population that it defoliates the tree like this, and there ARE natural predators that usually keep it in check. 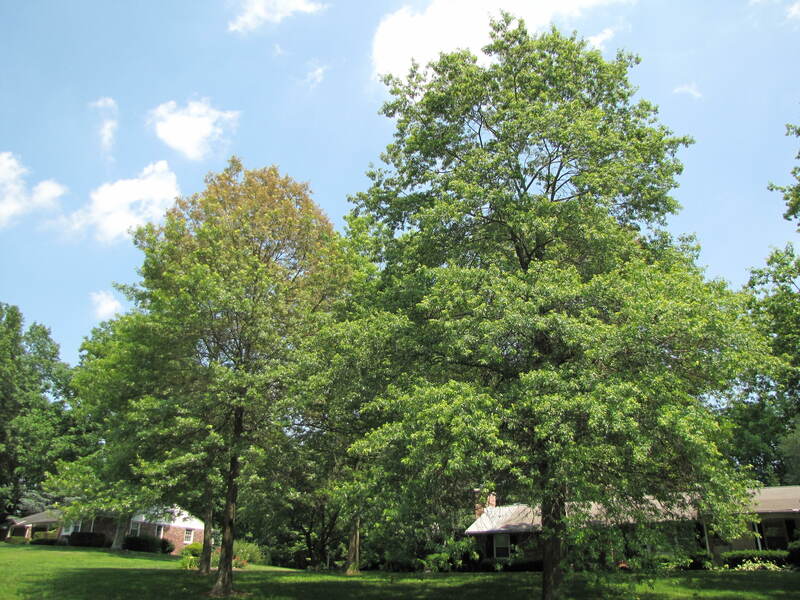 But in this case it could impact the tree’s health, so control would be justified. Control, by whatever method, would need to be done soon. Otherwise the larvae will pupate, and later in the year the adult wasps will emerge and lay eggs and there will be another generation! This morning we did a pest monitoring visit for a good client, a 250unit townhouse complex. 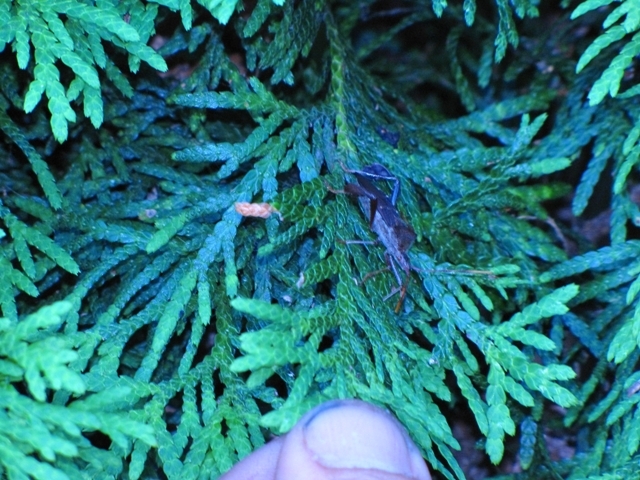 Historically the worst pest here (invertebrate that is) has been the bagworm, because of the preponderance of arborvitae and juniper in the landscape. 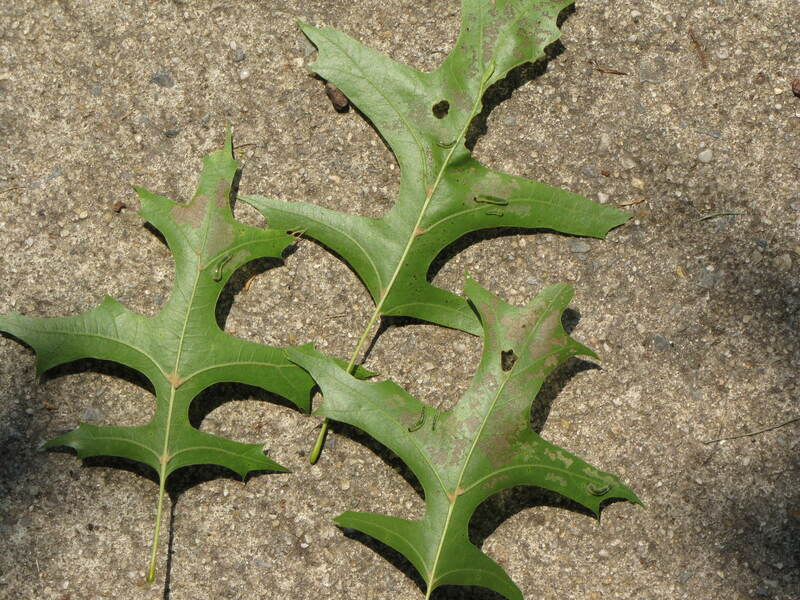 A big problem with bagworms is that to the untrained eye they are not easily seen, so they’re often not noticed until late summer when they are no longer easy, or possible, to control, and the tree has been killed or severely damaged. 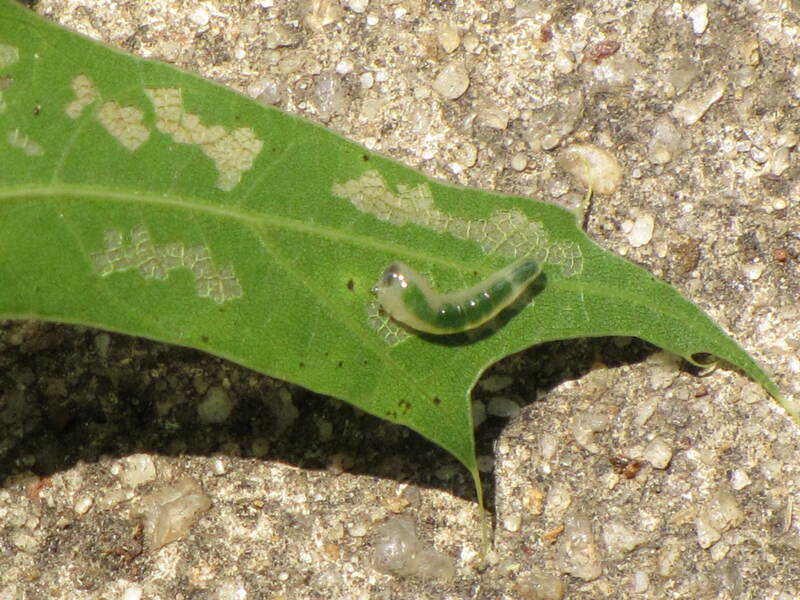 But early instar (young) larvae are EASILY controlled, you just need to know when and how to spot them. Cocoon of early instar larva. Can you see it? 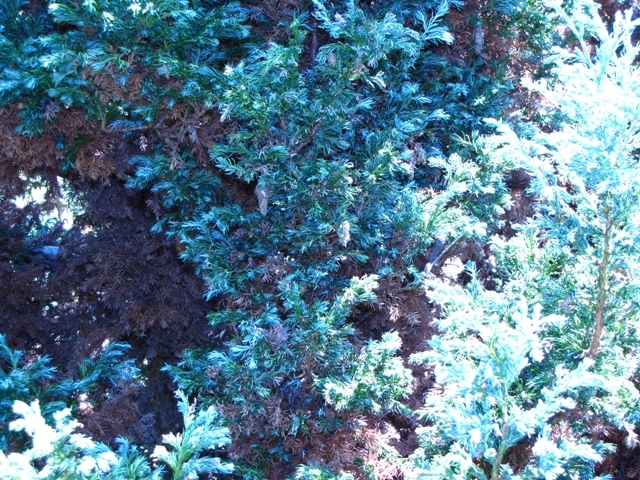 The caterpillar has camouflaged itself by attaching juniper needles to the cocoon! 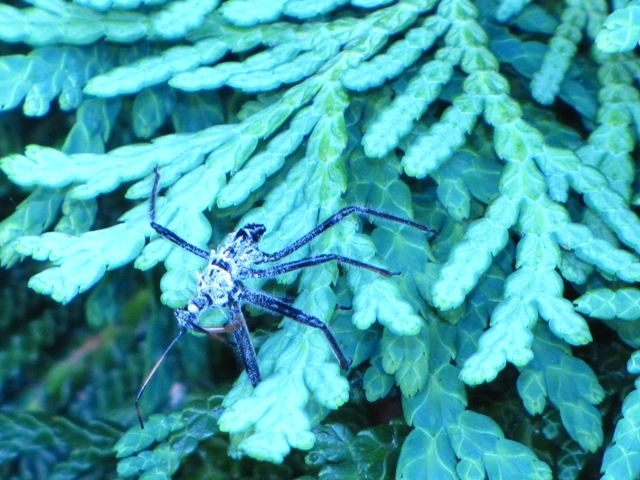 But what we DID find was lots of assassin bugs! That’s a good thing! 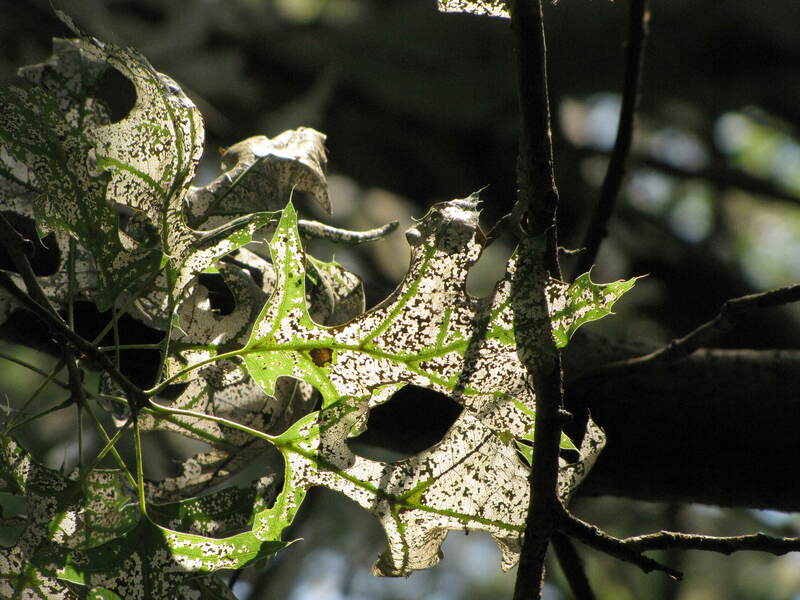 They’re a predatory insect – one of the few predators of bagworm. 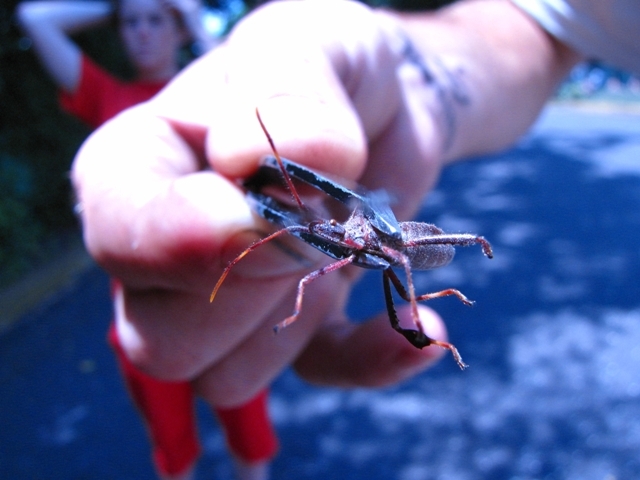 The bagworm larva’s cocoon protects it from most predators, but the assassin bug can attack it successfully because it has a long, pointy mouth part (rostrum) that it can insert right into the cocoon. 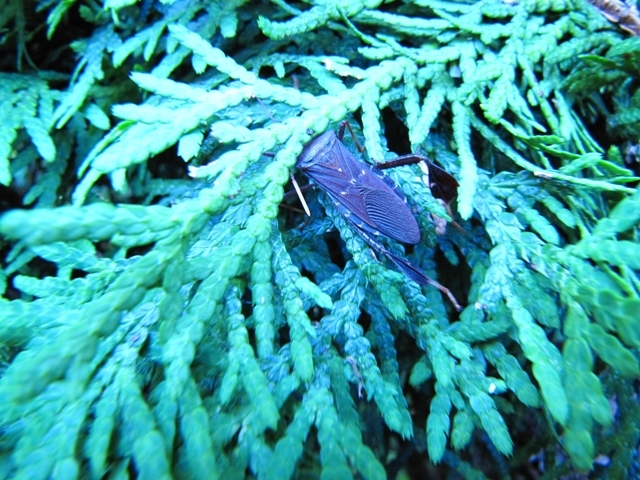 Anyway, the point of this story is that this clients landscape has very few pest problems. And it is because they DON’T use regularly scheduled pesticide cover sprays. 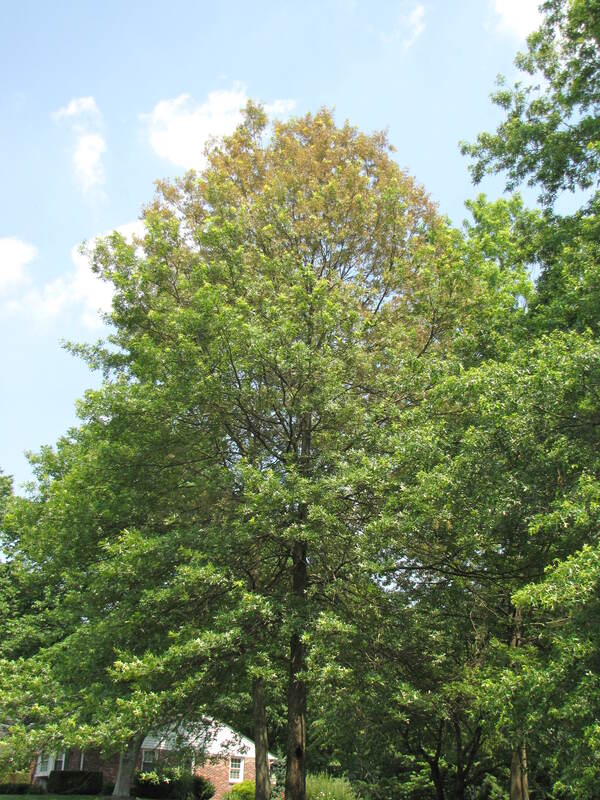 When we encounter a pest problem that reaches a threshold requiring an intervention we just target the actual pest population, we don’t blast the whole landscape with pesticides. And we use a control measure that can do the job with the least impact on non-target species. 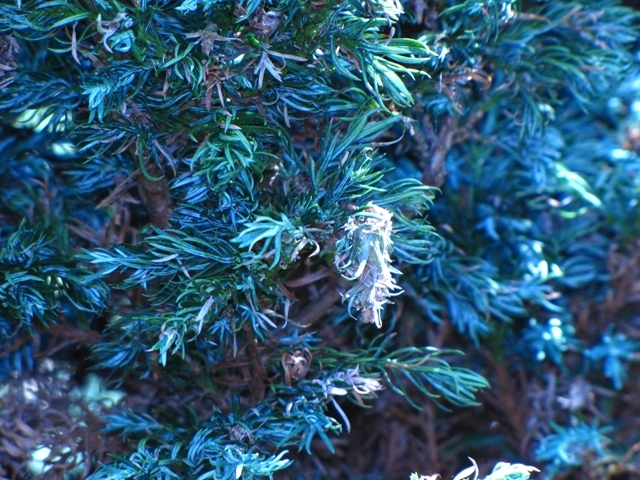 Bagworm can be easily controlled with Bt if caught in time. Bt only kills Lepidoptera, no other insects. So natural predators control almost all the pests for this client. The bagworms rarely get out of hand anymore. 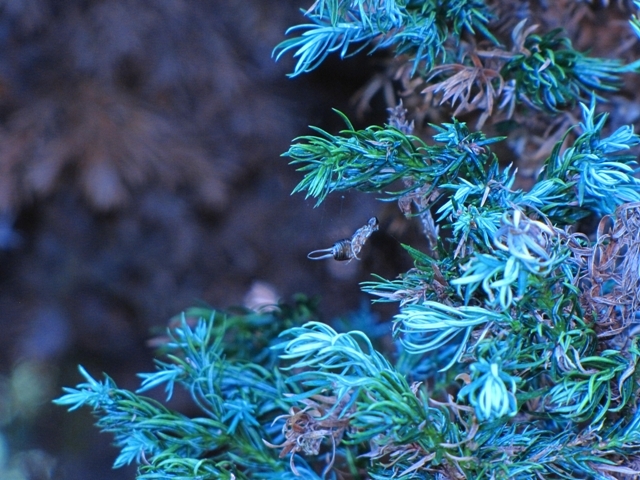 There are never any mite problems on the spruces or arborvitae or junipers. This job is really easy if you know what you’re doing. 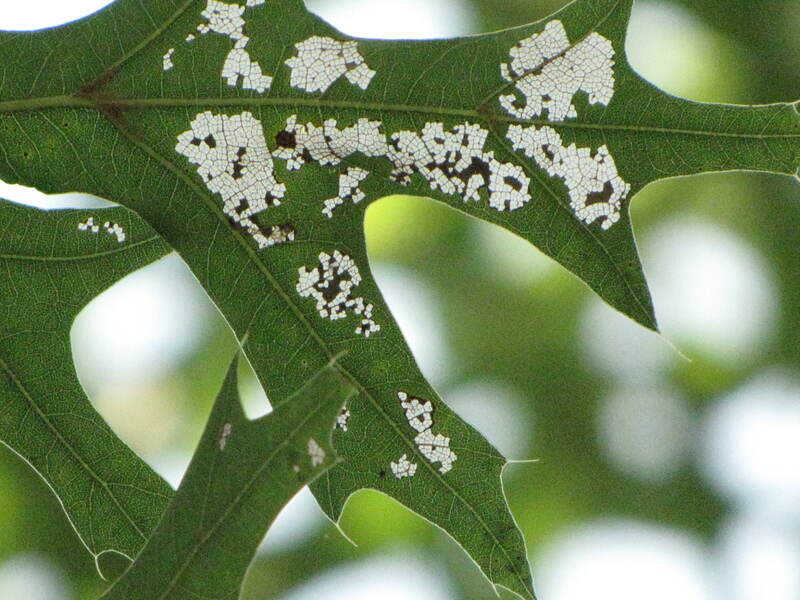 Unfortunately a lot of companies still manage pests with regular sprays, whether needed or not. This is stupid. It’s like bombing the hell out of an entire country just to try to get one terrorist bad guy when you don’t even know if he’s there or not! It’s a huge waste of money and ammunition, there’s loads of unnecessary collateral damage, and a lot of the casualties turn out to have been your allies! The lesson : diagnose before you treat. (treatment without diagnosis is malpractice) Monitoring plants is the first and most important step. 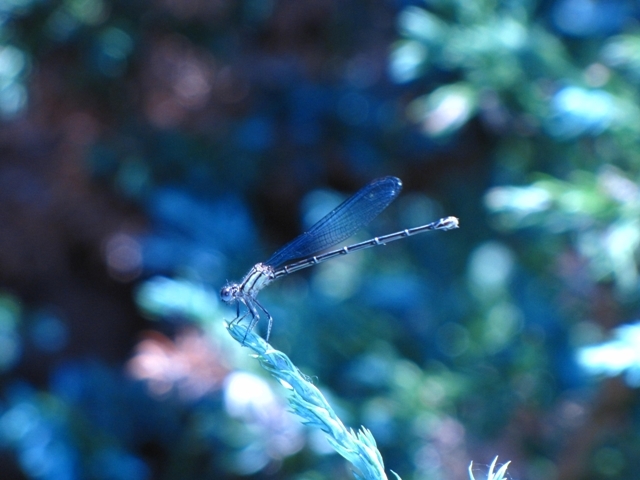 It is the key element in an IPM (integrated pest management) or PHC (plant health care) program.